The emergency system set is used to call for help in WCs or bathrooms in nursing homes and old people's homes or WC units in public buildings. It ensures that a person who needs help in an emergency can notify the relevant personnel. The system complies with the safety requirements of DIN EN 0834. 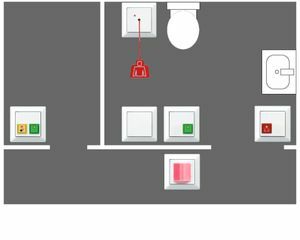 The well thought out structure of the emergency system set allows flexible arrangement that can be adapted to the relevant premises. The complete system consists of the emergency signal, pull cord push button, reset button and power supply. It is available in the AS 500 and LS 990 series.